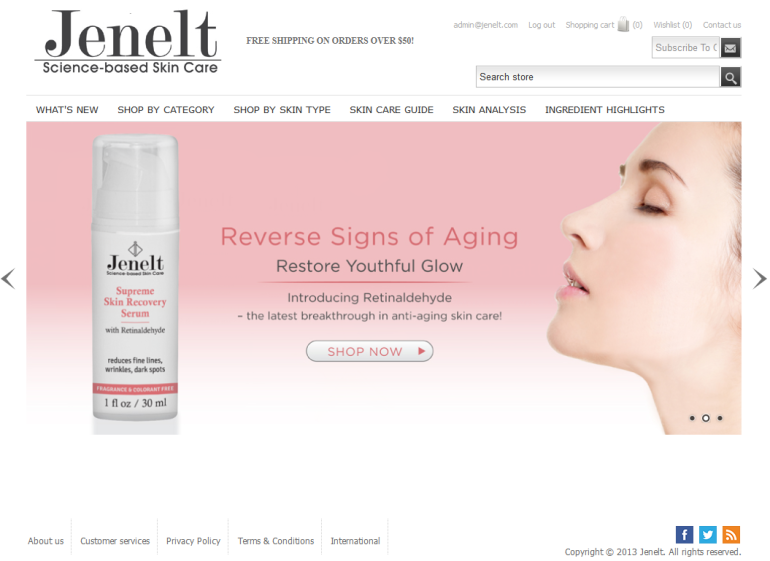 Client Profile: Jenelt.com is an estore meant to sell medicated skin care products. Challenge: The client shared the theme of the site, and we have implemented it to the perfection. The client came to us with a requirement of developing an online shopping store that would specifically deal in skin care products. Jenelt.com is an estore meant to sell medicated skin care products. The client shared the theme of the site, and we have implemented it to the perfection. To develop this site, we have used the “Nop-Commerce” , a third party tool and customized its functionalities according to the specific requisite. Additionally, we have used “MVC 4.0″ and “C#.Net” to implement a lot other functionalities. There are multiple modules in the website and we have implemented them in terms of helping the site work better. In the admin section we have implemented the functionality to export invoice details in PDF format. The Sales Tax Calculation functionality was also been customized according to California state; while tax rates of other cities were also been added. “PayPal Express Checkout”, “PayPal Direct” and “Credit Card” were the payment methods that were been implemented to facilitate the online payment functionality for the site.